In this media climate – and if you’re a student of pop culture, you’d think that slavery was invented by white people and only practiced by white people. While slavery is a shameful legacy of many nations – America included- it was neither invented nor promulgated by American colonists or European explorers. Slavery was around in Biblical times and continues to this day in much of the world, especially the Islamic world. Forgotten in the current narrative is the story of the Barbary slave trade, where up to 1.25 million Europeans were enslaved by Barbary pirates – in North Africa. In the 17th Century, Barbary pirates raided coastal cities in Italy, France, Spain, Portugal and even England and Ireland. In one Irish town, Baltimore, practically every inhabitant was captured and used as slaves back in Africa or on sailing ships, never to set foot in Ireland again. The “Barbary Coast” is the European term for the North African areas now called Morocco, Algeria, Tunisia and Libya. 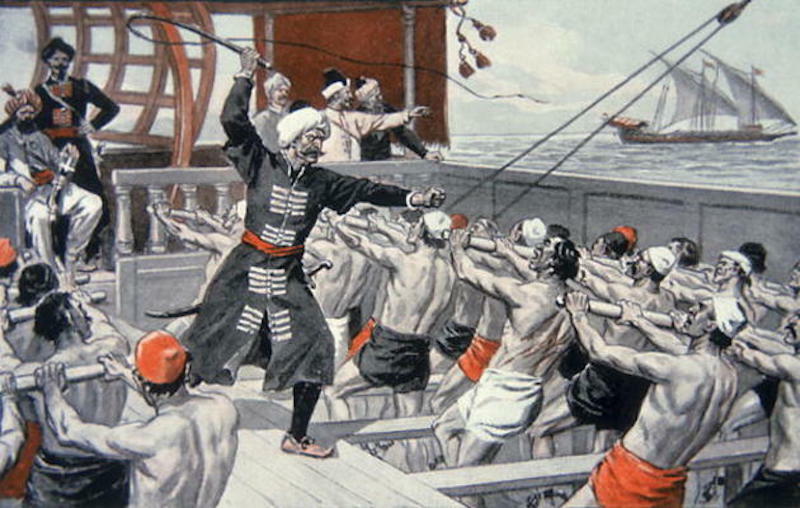 The pirate attacks were so severe that many coastal towns along the Mediterranean were abandoned until the 19th century, for fear of raid or capture. While this might seem like “race-based” slavery, that’s simply not the case, as the site ancient-origins.net points out. In reality, the corsairs were not concerned with the race or religious orientation of those they captured. Slaves in Barbary could be black, brown or white, Catholic, Protestant, Orthodox, Jewish or Muslim. And the corsairs were not only Muslim; English privateers and Dutch captains also exploited the changing loyalties of an era in which friends could become enemies and enemies friends with the stroke of a pen. “One of the things that both the public and many scholars have tended to take as given is that slavery was always racial in nature,” said historian Robert Davis, author of Christian Slaves, Muslim Masters: White Slavery in the Mediterranean, the Barbary Coast, and Italy. “But that is not true,” he added. Many of the slaves captured by the pirates died on the ships, assigned to man the oars of galleys, shackled where they sat, they ate, slept and defecated where they were. If they stopped rowing, they were whipped until they began again, or they were whipped to death. These raids continued until the latter part of the 17th Century, when Europeans began to become more powerful on the seas. But it took until the first years of the 19th Century – and with the help of the US – to fight back against the Barbary Pirates enough to get them to stop. This is a part of “slavery” and the slave trade that they don’t teach in American schools. Slavery is about one group of people subjecting another group to subhuman treatment, whether it’s race-based or not. It happened all over the world. Race was merely a cover – or a convenient excuse – for this human atrocity.